Selecting the Shot. . .
Spring has sprung in parts of the world, and the flowers are coming forth. Often times, locations are crowded with people when the light is best for shooting. 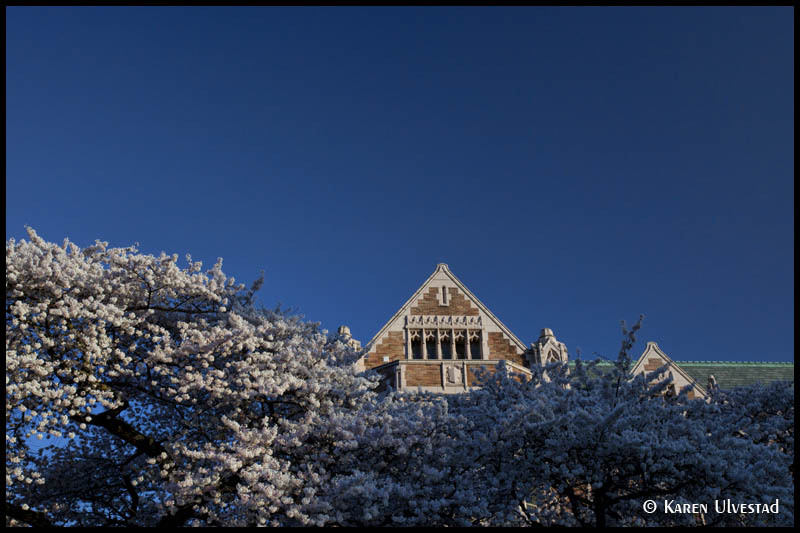 In the Puget Sound area, spring means cherry blossoms on the University of Washington campus, the Skagit Valley Tulip Festival, and Washington Park Arboretum. Every season has its crowds. . .so, how do you find the photograph? In the photo above, the throngs of people are obvious, and the garbage cans are over-flowing. The scene is quite noisy, and full of activity. Everyone is out because of the sunshine and the cherry blossoms. This is Sunday on the University of Washington campus (at the Quad). It is late afternoon light, which is warmer than mid-afternoon. 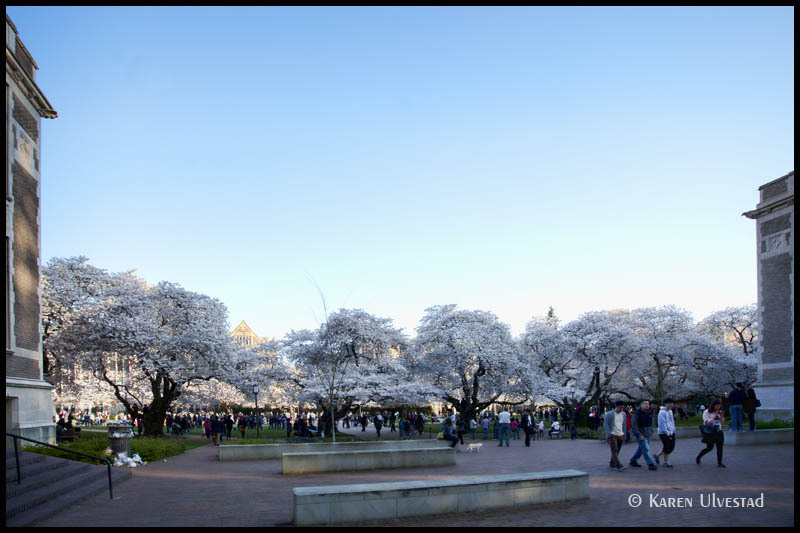 One way to cut-out the crowds is to choose selective portions of the buildings and cherry blossoms. The image above shows the Gothic architecture against a vivid blue sky, and framed with the subtle pink cherry blossoms in front. The crowds are below the bottom of the frame, and the photo takes on a peaceful quality. It exudes quite afternoon on campus. Another way to exclude the crowds is to change perspective. 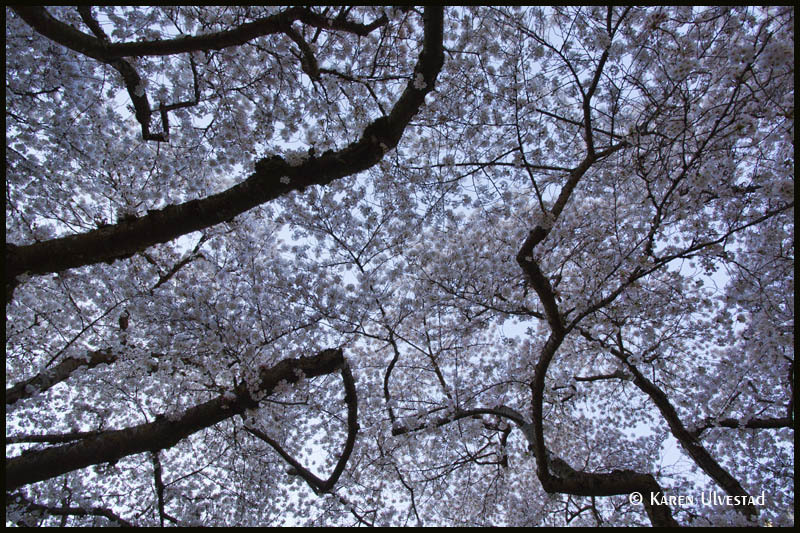 This shot is looking straight-up under the cherry trees. The branches become a linear component of the composition with the repetitive pattern of the cherry blossoms. The only limit to the possibilities is one’s imagination. . . Thank you for sharing my blog. . .